Students at UNLV say they are working with police to tackle the amount of crime happening on campus recently. From papers to exams, there's a lot on any college student's plate. But for those at UNLV, there's one more thing that shouldn't be. “You're here to get an education you're not here to worry about being safe,” say UNLV Student Body President Christopher Roys. The campus is now on alert after a student was attacked and robbed in Parking Lot F near Maryland Parkway and Tropicana. Police say the suspect then stole a car not far from campus. 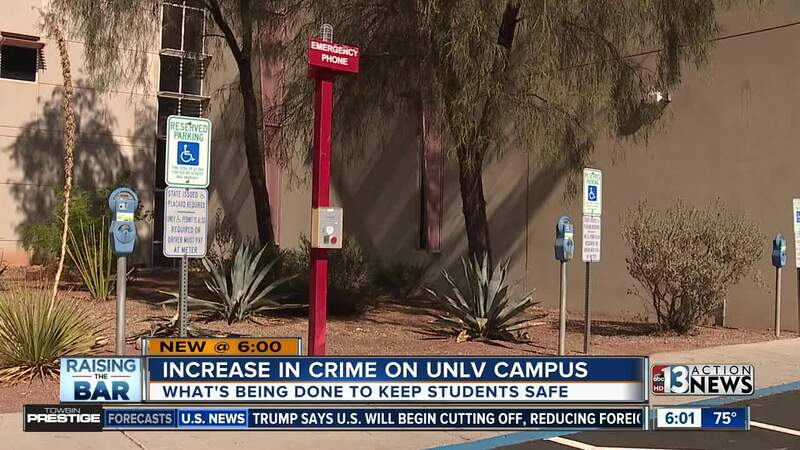 This incident comes just a month after UNLV Police released a warning to students and faculty to remain vigilant in the parking lots. “It bothers me seeing i can't leave my car out in the open,” says Moises Rad, student. UNLV Student Body President Christopher Roys says students are taking their safety into their own hands. One of the ways students are looking out for each other is “Rebel Ride." It's a free service that shuttles students around campus at night. “It's making headway and it's not only going to be a measure to create piece of mind for students but also functional utility of safety." Police are also stepping up patrols and installing more emergency call boxes around campus. But concerned parents say these steps should have been taken much earlier. “There's no one walking around and its making criminals feel like they don't have anything to worry about,” says one parent. But Roys says a safer campus won't happen overnight and will take a community effort. “It takes more than just UNLV doing their job, it also takes the county, Las Vegas Metro Police, it takes a lot more communication,” says Roys. UNLV Police were unavailable for interview Monday, but said they would be available for an interview later in the week. If you have any questions or concerns that you would like 13 Action News to ask UNLV Police about, email us desk@ktnv.com.